Completely stop phone calls that look like they're coming from phone numbers similar to yours. We're all sick of getting these spam calls, and now you have a simple and easy way to do something about it! 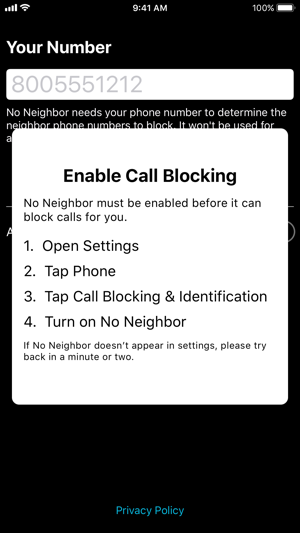 No Neighbor is a call blocker that sends these scam calls, known as "neighbor spoofing" or "neighbor spam" directly to voicemail, so your phone never rings and the scammers get no satisfaction. Every call from a number with the same area code and prefix as your phone number will be blocked. 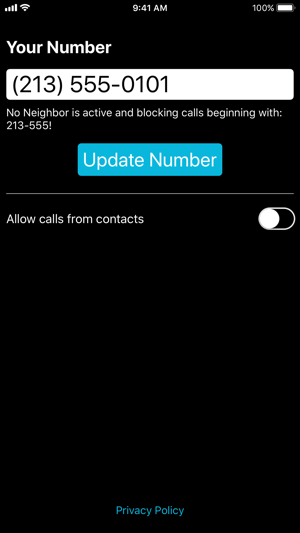 You may optionally allow calls from numbers that are in your contacts. 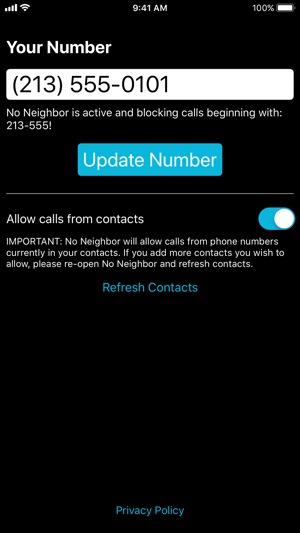 Please note that if you don't use that feature, No Neighbor will send ALL calls with the same area code and prefix as your number to voicemail. This means that if you have legitimate friends or family with phone numbers like that, their calls too will go directly to voicemail. No Neighbor works only with phone numbers from the US and Canada. After reading some reviews, I feel there’s a misconception on the meaning of the phrases “get a call” and “blocked call”. The meaning of “get a call” to me is simply the end result of someone dialing my number combined with my phone being on and within signal coverage which makes it ring or vibrate. 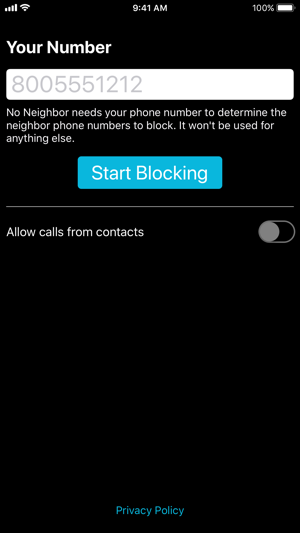 If it doesn’t ring because of the app, then I consider that a “blocked call”. It doesn’t matter if that blocked caller gets sent to voicemail. Your phone didn’t disturb you with that call you didn’t want, and this is not “blocking a call”, then, what is?? If you ever feel like taking a look at your phone’s blocked list, then that would be your choice. I do realize some people want “blocked calls” as phone calls you do not ever want to even know about or get sent to voicemail. But that’s not in the description. Yeah, I wish the app provided a list with those blocked numbers, sure, but as stated before, this app works AS ADVERTISED!!!! Geez....!! Description CANNOT be clearer. I assume (and frankly expect) that Apple will eventually add the functionality of your app to iOS and hope you make a good buck on it beforehand, or perhaps succeed sell it to them! Sends all calls starting with the same 6 digits as my phone number straight to voicemail... including my wife. Allowing access to my contacts lets the wife get through. Now if the developer would let me send ALL callers not in my contacts straight to voicemail, I’d be ecstatic! Good job so far Mr. Harding. Requires iOS 11.3 or later. Compatible with iPhone, iPad, and iPod touch.